Phi Phi weather July is often mixed. It has some high-season-like days during the second half of the month but is quite variable until about 15th. July is one of the key low season months where the weather emerges from the first monsoon. Phi Phi island is often packed at this time. The first monsoon happens on a period centred on the middle of June and often lasts a total of 6 weeks. This means that Phi Phi weather July has very changeable but improving first 2 weeks. After the monsoon has passed north the skies clear even though it is still humid and there are winds. The temperatures in July are a lovely 30 degrees in the day time and 27 degrees Celsius at night. It is good to note that during or after any hard rains the temperature can drop to around 22-24 degrees Celsius for an hour or so until it warms again. The wind is dominantly from the west so that ferries 'Phi Phi to Phuket' are always sail into the waves and are less comfortable than the 'Phuket to Phi Phi' sector which is relatively calm sailing. 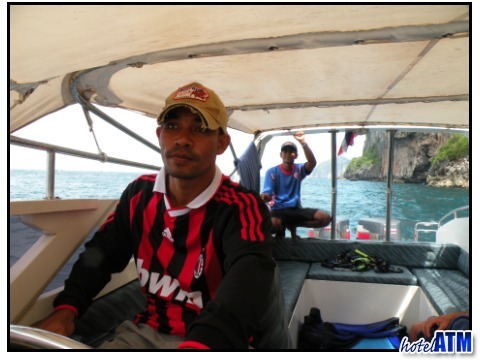 Likewise 'Krabi to Phi Phi' is worse than 'Phi Phi to Krabi'. Phi Phi accommodation in July puts the room pricing in the low season weather category which is great for tourists. These prices are 40-50% cheaper than the high season. On top of these great price differences, the island offers it's Phi Phi Hotel Deals to keep their resorts as full as possible. This can mean you are paying 60-70% less than high-or-peak season prices for the same room. So, judging the weather right in July can make for superb value. Phi Phi weather July (link shows rain radar and more) is a busy time for the main village on Phi Phi Don. European University students, gap year students and travellers arrive in great numbers. Australians, Brazilians and South Africans are escaping their winters so the island is full of interesting people during this July weather. The atmosphere on the island is full of younger, fun-loving-traveller scene which makes for a great party atmosphere especially in the town bars that have roofs like Dojo Bar and the Reggae Bar. This same fun-loving-traveller scene does the monthly migration to Koh Phangan for the celebrated Full Moon Party. This event attracts so many party goers to the east coast of Thailand that the Phi Phi bars quieten noticeably. For those that are on Phi Phi to take in the sights and do tours, this is a great time to visit as the beaches and reefs are quieter. Phi Phi weather July does effect the tour program but not as much as you might think. The 300 meter walls of Phi Phi Don make excellent protection against any westerly winds so that there are always good snorkeling beaches to be found (Hao Ragote, Runtee Bay etc.). Maya Bay on Phi Phi Ley might be inaccessible from the main entrance but the adventurous walk through route means you can get to the iconic beach even in the depths of a windy day. For this you need to be on a tour going to Loh Samah, the adjacent bay where the walk through starts. Diving during the Phi Phi weather July is a mixed bag. Good sunlight and no wind often makes for the best diving as the sun can penetrate the depths and less waves disturb the ocean bed. Having said that, and due again to the cliffs, there are always good dive sites in July. On Phi Phi Ley, Loh Samah and Pi Ley walls dive sites make interesting days on the water. Further inshore the walls off Hao Ragute and the pinnacle Hin Dot, at the mouth of Tonsai Bay, are memorable. When the wind drops enough the Bida Islands and the west coast of Phi Phi Ley are accessible and add to the potential for diving fun. Tours run through the whole month of July with the main one day cruise on the Phuket to Phi Phi Sea Angel being the most popular. As mentioned above, the winds can get up from the west so being on the largest ferry makes for the best crossing. The clear sky views make for some great sights and a great day out. The tour has pick-ups and transfers from all the main beaches on the west coast of Phuket.